Solid brass dog id name tag handmade by ourselves in solid brass and deep engraved with your contact details. Every tag is highly polished and the text is in filled with black enamel that will not wear off. This product has a minimum order quantity of 1. 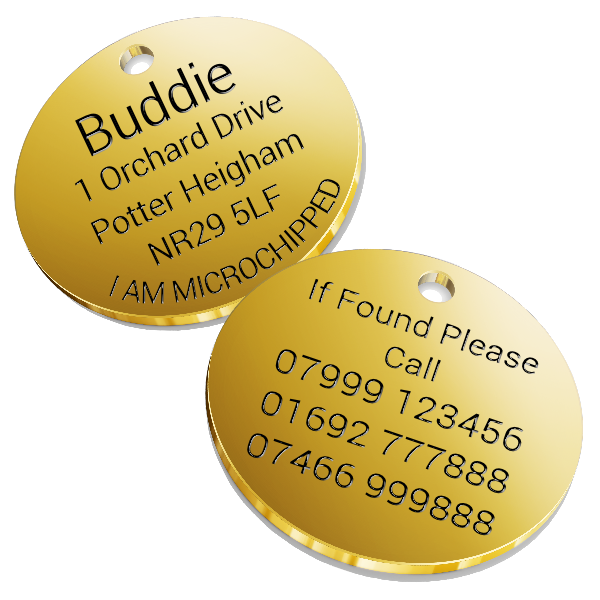 We can engrave 5 lines of text on each side of the solid brass pet tags. Your tag will be deep engraved and the text will be black in filled by us using the correct methods. These Tags are handmade by ourselves from 1.5mm Thick Solid Brass. Very Please with the speedy delivery of my item. i will recomend you to all my friends at the dog show this year. Thank you so much for my tag i canrt beleave the quality its fantastic. thank you. thank you. thank you. What a beautiful tag. ill have to try and keep it polished. Thank You Debbie.